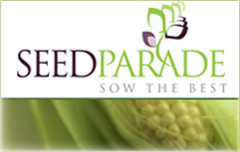 That's a lot of seed at Seed Parade's prices - but they're not just cheap. I've been using Seed Parade for about three years now for my own allotment plot seeds & I find them to be good quality & excellent value for money. Here's your opportunity to try them FOR FREE! Here's the really good news. You don't have to enter - you just register on this Forum as a member and you sit down and contribute your posts. It's that easy! From the time this competition starts to run (which is as soon as this message is uploaded) your posts will start to be counted. At midnight on the 31st of March 2014 the post logs of the forum will be recorded. The member with the highest number of posts will be declared the winner. The winning member will then be sent the Â£25.00 voucher by e-mail to the address they used to register on the forum. The result will be declared on here. The e-mail address to forward the voucher to is clearly displayed in the top right hand corner of SEED PARADE's home-page. EVERYONE who has registered and posted on this forum. The only exceptions are The Forum Administrator & the Global Moderators (for obvious reasons). So get posting the meter's running!